Did that get your attention? That’s the world Bernice Koehler Johnson travels to every year to teach English to Shan refugees who have escaped the persecution of the Burmese military and were able to cross the border into Thailand. In her book, The Shan: Refugees Without a Camp, Bernice chronicles her travels to the other side of the world telling heart rendering stories of her students and the sacrifices they went through just to go to school. Bernice Johnson, an incredibly young seventy-two year old woman, grew up on a farm in Minnesota. She found a way to avoid Minnesota winters by teaching English in warm climate countries. In 2001 she was going to add Thailand to a list including Mexico, Spain, Indonesia, Ecuador, Turkey, to name a few. But something different happened in Thailand, and that something is eloquently told in a first person narration about the plight of the Shan people. It’s those stories that have brought her back every year (except one when she had to face a Minnesota winter because of knee surgery). Bernice talks about herself in a very honest way, not sugarcoating her biases and prejudice. She readily admits her errors in judgment making her human rather than portraying herself as a hero. But to the Shan children she truly is a hero. It’s the stories about individual children that is the focus of this book and gives it such a touching and personal feel. What struck me throughout the book was not only the hardships that so many of the children faced, and the risks they were taking just to be able to attend school, but the hope and optimism so many of them shared. The second half of the book, at the request of her students, Bernice crosses the border into Burma. They want her to see, first hand, their homeland (and a homeland where they cannot return). But it’s not all doom and gloom. In all the trepidation (at times she was followed by military personnel) there is humor. Bernice ends the book with a where-are-they-now section. Some of her students are successful, some are not. 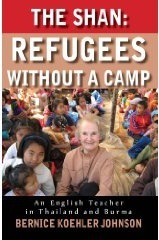 As stated in my title, The Shan: Refugees Without a Camp was hard to read, harder to put down, and nearly impossible for me to review without sounding like I’m shouting from a pulpit for everyone to get involved – that YOU can make a difference (in the back of the book there is an address to send donations). But this book can make Sai Sam’s wish come true – the world can finally hear his story. Ms Johnson’s chronicle tells us we need to expand our definition of hero from someone who meets danger with danger to someone who meets danger with love. I nominate her for The Peace Prize. I’m so glad to see this topic covered in book form and anxiously await the arrival of my copy!